We had a wonderful day with Toby Williams, our tour guide for Edinburgh. Toby is extremely knowledgeable about the city, easy to understand, and very accommodating. He connected well with my 19yo son, a history major, and was gracious and kind with my 7yo granddaughter, an active child. Lunch choice was excellent for us. The amount of time allotted to walking and riding on a cold winter day was perfect too. Thanks again, Toby, for a great Scotland experience. After our first tour fell through due to an unfortunate illness, Toby stepped up and within 24 hours put together a last minute tour to the north of Edinburgh. My daughter and I had an amazing time filled with beautiful sites, education and laughs. I can't begin to thank Toby enough. And of course I am so happy to have used Tours by Locals again. Thank you thank you!!! What an incredible day!! Terrific personalized experience. Toby was prompt, engaging and funny. In spite of short days of winter he covered a lot of ground. His vehicle was comfortable and his driving expert on the small curvy roads. We highly recommend his services. Spent 3 days with Toby over 4 days. 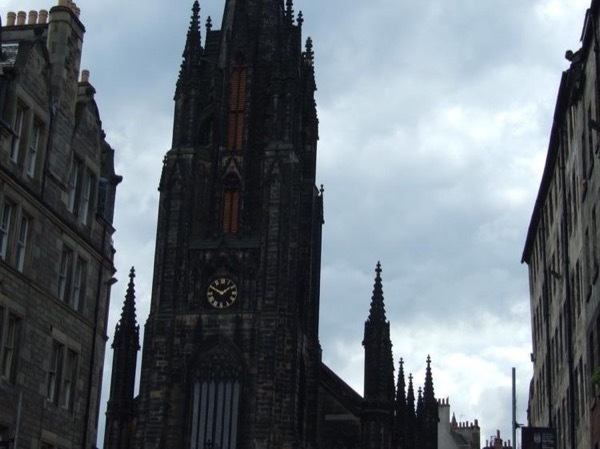 Glasgow, Edinburgh and abbys and chapels around Edinburgh. Toby is a renaissance man. There are few subjects he has not considered and has an intelligent position on. He can discuss history, achitecture, the religious chronology of Scotland/England, theology, current events or international politics. Or none of these if you choose to to have him show you your specific interests in Scotland. He will accommodate you in whatever you want to see. Just let him know. Toby did a very nice job showing us the sights of Edinburgh and beyond. He was extremely accommodating and informative all along the way. The knowledge of local sights was great, and his awareness of how to avoid crowds was also quite helpful. He was kind enough to indulge us in an unscheduled stop at the tiny Beatrix Potter exhibit which was well worth a stop en route. Highly recommend! This is our second day with Toby and his knowledge of not only history but architecture, politics and local folklore was wonderful. I would call on him again if I come back to Scotland. Took us to Hadrian's wall and many towns on the way there, the countryside of Scotland is worth seeing by car, this is the way to see the country and Toby was very good at it. Tomorrow we go to Glasgow with him as he was excellent. Last day of our two week tour with Toby. Hard to say farewell to our guide and now friend. As promised Toby took us to discover Scottish sea glass, Falkirk locks, and Kelpie horses getting us to our airport hotel in a timely fashion. He made sure we visited all our desired spots, making our travel wishes come true. Toby's credentials are superb. Even though it was a bankers holiday Toby filled our Glasgow tour with wonderful architectural insights, Rennie MacKintosh designs, shopping spots, museum gems and convenient loo locations. He knows his stuff. The posted Glasgow motto, "People Make Glasgow", certainly applies to Toby as he designed our tour around us: "Toby Made Scotland" for us. Toby drove expertly along lovely winding roads to New Lanark for tour of mill village before taking us to our little known Heritage Centre in Crawfordjohn and got us to Rowallen Castle before dark so we could get photos. Excellent driver on single track roads and all the roundabouts. Viewed sites in Oban including Toby's evening before discovery of McCraig Family Memorial at top of hill with gorgeous overlook. He took another scenic route via historic Luss, stopping at grocery for picnic supplies and had us comfortably settled into our castle BnB. Toby got us to Fort William on time for our Jacobite Steam Train ride. Needed to stretch our legs after riding so Toby stopped so we could walk at Dragon's Tooth Golf Course. As he dropped us off at Oban bnb Toby made sure we had dinner plans before heading to his lodgings. He was always so considerate. Ferry cancelled due to high winds so Toby devised alternate route and then unforeseen car trouble happened in Portree. (Toby had had car checked thoroughly over before we started trip.) While Toby got a rental car we souvenir shopped and were back on the road again in no time enjoying Skye's beautiful scenery. Like I have stated before he's a pro and can handle problems smoothly. One of us had lost Rx so Toby got us to local hospital for ER doctors advice. We continued on our journey rest assured. Toby drove south side of Loch Ness avoiding numerous tourist buses on a rainy windy day so we could sit back and enjoy the wet but beautiful Highland scenery. Just across Skye Bridge stopped for lovely lunch at Nice Cafe and Bookstore combining two of my favorites. As we drove to bnb he handled the hairpin turns smoothly. He's a pro! Lots of sites in Elgin and Inverness so Toby helped us select the most interesting. He knew shortcuts to avoid long lines and locations of closest necessary rooms! Toby's love of country and his depth of both current and historical knowledge were certainly evident. On his recommendation we added the unique, just opened, V&A Museum in Dundee viewing interesting exhibits on Ocean Liners and Scottish Design. Found Arbroath Abbey fascinating with Toby pointing us to a room off to the side we would have missed exhibiting the 1320 Declaration of Scottish Independence. Toby got us to the Dunkeld Cathedral just in time for church bell chimes and on to St Andrews to walk course on Sunday. He knew the best shops to get golf hats and ball markers. He's a wealth of knowledge on all fronts. Toby's love of country and his depth of its historical knowledge is certainly evident on this castle/palace tour. He also knew the best shortcuts to avoid long lines and location of closest necessary rooms! He's a pro with great credentials. Day 3 of our tours with Toby was custom designed to visit the abbeys meaningful to us. Toby's advice on taking self guiding tour, listening to the docent or just walking through were right on. He's a pro at sharing knowledge about each stop and suggesting delicious pub lunches and stopping for great photo ops. Toby met us at the Edinburgh airport and following his advice we viewed three Outlander castles we had requested thus making great use of our time. We continued on to get an overview of city arriving at Stockbridge air bnb in time to meet host. Very knowledgeable, thoughtful guide, wonderful driver. We had Toby for 4 days; met us at the hotel at 10:00, back no later than 4-4:45pm. Covered Edinburgh and toured outside the city in a very comfortable car. He knows his subjects extremely well and has a pleasant personality. Toby was very amenable to customizing, so if there's something you want, that you do not see described in the tour, just ask. I have placed this same review for all four tours because we saw so much and loved every bit of it. This was a trip of a lifetime. Toby is extraordinary; a rare combination of a vast knowledge, energy, and thoughtful consideration for the client's wishes and comfort. Designed a long delightful day packed with stunning historical sites. Could not desire anything more in a guide ! Toby was an excellent guide. He was extremely knowledgeable and flexible with our agenda. We wanted to see as much of the highlands in one day as possible, and he did it! Some great stops along the way to stretch our legs and take in the beauty and history, a fabulous fresh fish lunch in Oban. It was amazing. Toby's Land Rover was quite comfortable and clean for a long day and comfortably fit 4 adults in addition to Toby. I would highly recommend you book a tour with Toby. We enjoyed seeing the beautiful Scottish countryside with Toby, a knowledgeable and relaxed guide who adjusted his itinerary to avoid crowds and to show us some less touristy places that were charming. He was also a great source of information for the best restaurants near our hotel. Toby was very flexible, which allowed us to see things that were less mobbed by tourists at the International Festival. He also suggested places based on our personal interests. He didn't watch the clock, and gave us more than our expectations. Great experience. We enjoyed our special tour of the Scottish Borders and Roman ruins with Toby very much. He is a wealth of knowledge and really enjoys what he does. We had a great adventure touring Melrose Abbey, Jedburgh Abbey, some wonderful Roman ruins. Alas, we didn't ever find the elusive Hadrian's Wall but Toby did get us to our train on time. All in all, it was a fun and interesting day. There is just so much to see! We would love to do this again and highly recommend Toby to visitors in the future. TOUR GUIDE RESPONSE: I am sorry there was just not enough time to do the Abbeys and Hadrian's wall itself in time for your 5pm train. Chesters hill fort actually has more Roman remains to see than Hadrians wall itself that requires more time than we had before getting to Newcastle. Toby was an excellent guide who gave us the opportunity to explore and admire Scotland and see its beauty and splendors. His patience, intelligence and his love for Scottish History were remarkable. Thank you for this wonderful experience. Toby met us promptly at the cruise terminal in a comfortable Land Rover and was an excellent guide through the country side and some interesting abbeys, palaces and estates. He was very friendly, knowledgeable and informative. Highly recommended. TOUR GUIDE RESPONSE: I am very sorry because I never knowingly let anybody pay my entrance fees. Somebody must have just done so graciously, with larger cruise ship groups it can be hard to keep track. I was about to pay my lunch but as you offered I thought it would be ungracious, indeed crass, to refuse. The entrance fee must be Culross Palace because I get in to all other sites. You probably did not notice, but actually I saved everybody in the party the Dunfermline Abbey entrance fee through my connections earlier. We could not been more pleased and honored to be a part of the Elite Falconry tour. Seeing the work and dedication and being given a glimpse of the life of the guardians of the magnificent birds was a highlight of our trip to Scotland. Our guide Toby was timely, his vehicle large and comfortable. After our falconry he gave us a condensed tour of Edinburgh due to time constraints. We saw the old town, new town and harbortown. He was very knowledgable and provided a great historical overview. Toby did a wonderful job. He even met us earlier at our last minute request. Toby is extremely knowledgable in regards to the subject matter of each site visited. He has a great personality and was very flexible during the tour when we wanted to make some changes. Toby is a very warm, humorous, knowledgeable guide. He is very intellectual and gives you a ton of information. We enjoyed him very much. Toby was a wealth of information and had an unbelievable grasp of the history of all the sites he took us to.. He was friendly and informative, And made our last 2 days Just perfect as we returned to Edinburgh would highly recommend him for this particular type of tour. Toby is a terrific guide, both knowledgeable and personable. He was able to tailor our tour to see the places in which we had the greatest interest. Very informative and covered all the sites we wanted to see. Our guide was an expert on architecture which added to our understanding of the city (but maybe a bit too much) He was pleasant and accommodating when we requested some changes to itinerary. Lots of walking with inclines for those who may be less mobile. Toby was an absolute pleasure!! He is unbelievably knowledgeable about Edinburgh, St Andrews and all of the Fife coastline. The highlight of the trip was stopping for lunch in the small fishing village of Pittenweem! Five stars and two thumbs up for a safe and comfortable ride as well!! Toby modified the tour at our request and took us to some sites that were less crowded so that we could spend more time. He enjoyed the sites like Rosslyn Chapel and the other Abby's and Castles we saw that day and he was knowledgeable about the history and seemed to know many less frequented sites that were actually better than many of those that are more well known and sites for good photos. We had 4 in our group all over 60. Toby picked us up promptly and we started our tour of Rosslyn Chapel, Craigmillar Castle, Edinburgh Castle, Rebus and Harry Potter sites, Old Town and New Town. Toby was engaging, knowledgeable and personable. We had to change some of our plans because the Queen was in residence and some areas were closed but he still managed to keep our tour flowing smoothly. We had an ambitious itinerary with Toby and he was very adept at seeing to it that we saw everything planned without our feeling rushed. The places he chose for us were just the kinds of places which as travelers we enjoy. I can highly recommend Toby to anyone wanting to see the real Edenborough. Toby was flexible and knowledgeable. With very bad traffic conditions , he was able to maneuver as best he could to make good time. He suggested skipping Edinburgh Castle in favor of Rosslyn Chapel and Holyrood....good move. Interesting conversationalist. Toby was outstanding and went above any tour guide. Family of 5 from USA with 18, 15 & 7 year old daughters. Our little girl was crying with bad ear pain. With Scotland's socialized medicine we didn't not know what to do but with Toby's help we were able to get her taken care of and the rest of the day was AMAZING. We visited Stirling, Linlithgow, and Blackness. Such beautiful sights and he even went in with us and was our personal guide inside the castles. The day was catered to our needs BEST DAY EVER! Toby's knowledge of the Abbeys is amazing. We really appreciated the drive around Edinburgh but the drive through to countryside was perfect to the abbeys. The stop for lunch in Melrose was great way to spend a rainy afternoon, before going out again. Thank you. This was an excellent tour. Toby was very flexible, knowledgeable and accommodating. He told us so much about Edinburgh that we would never have known. He was also willing to customize the tour to what we wanted to do. Thanks so much! Toby took us for a full day of exploring Glasgow— both driving and walking. A passionate advocate of the architecture and history of a sometimes underappreciated city, he introduced us to multiple sites of the great Charles Rennie Macintosh and other great Scots architects. We enjoyed a rooftop view of Glasgow, strolled Buchanan pedestrian mall, explored Kelvingrove Museum and finished with the Cathedral. Toby was enthusiastic, thoughtful and just fun company. Highly recommended. Toby is a very knowledgable well educated guide. Totally accommodating, great personality and easy going. I could not have gotten a better guide. I highly recommend him. We had a great time learning all about the things and places around Glasgow and Edinburgh. We were both impressed with the depth and detail of his knowledge and reveled in his enthusiasm and pride when showing us around. He managed to pack in a lot and even showed us the garden he shares with others who live in his area. We were very impressed by Toby's enthusiasm on top of his knowledge and professionalism. The choice of the itinerary was amazing, as we managed to see less touristic spots but not less interesting (quite the opposite). It was also quite a long tour but not tiring at all. Toby was just great. So knowledgeable. Loved the whiskey tour. Toby was a pleasant and knowledgeable guide. We enjoyed our full day tour despite the frigid temperatures. We spent a very pleasant full day with Toby. Driving plus walking was an ideal formula as it was cold and windy and this also allowed us to visit places outside of the city centre such as fascinating Craigmillar Castle. Toby is extremely knowledgeable and passionate about Edinburgh, its history and its architectural beauties. He offered us glimpses into secret corners of the city, made every stone and brick come alive with his stories, and was always happy to answer our questions. A top class guide! Toby was a wonderful tour guide. His knowledge of history and architecture served to enhance our experience and appreciation of Edinburgh. We highly recommend him. Toby was fascinating! He was enthusiastic about his tour, showed me all sorts of curiosities of the city, and gave me a personal look at Edinburgh. His knowledge was vast, and I could have spent twice as many hours with him learning and being enthralled. He was awesome! I am particular and he didn't disappoint. Would hire a tour with him again in a heartbeat. We hired Toby as our guide in both Edinburgh and Glasgow. The risk is...what if you don't get along so well in the first city and now you're stuck! No problem! Toby is a bit of a scholar so maybe on first impressions he seems perhaps removed. Not the case. We adored his intellectual enthusiasm. He has a keen interest in architecture and history and made the information relevant and provocative. He is warm and earnest in his desire to provide a great experience to interested travelers. My daughter and I had booked a walking tour of Edinburgh. Toby was our guide for the day - or rather the perfect companion to walk about the town. The passion he has for his hometown can be felt every step of the way and it is frankly contagious! Educational and intellectually stimulating are how I would best describe our tour. I will definitely book a tour with Toby again next time I visit Scotland. We had a wonderful tour with Toby. He has an unsurpassed knowledge of the City of Edinburgh and Scottish history. It was a delightful day and we very much enjoyed Toby's company. We found Toby to be very knowledgeable about the history and architecture of Edinburg. He personalized the tour to match our interests and did a great job in doing so. I would recommend him to others and value his expertise. Toby Williams was absolutely wonderful. So informative, such a great sense of humor. A real joy to be with throughout the day. He went out of his way to extend our tour to include additional stops and points of interest. Toby is exceptionally knowledgeable about Edinburgh's history and architecture, and a day spent with him opened up glimpses into the City that we would never have been able to discover on our own. It was wonderful to be give private access to the closed gardens of New Town, and the Old Parliment Building. And the Museum of Scotland was a most pleasant discovery, which we probably would have skipped. His opinions on the renovation and reuse of historic buildings were interesting to hear and discuss. We had a delightful day in Edinburgh with Toby. We saw a great deal, by car and foot (more than we could have accomplished on any ship tour). Toby was a fount of knowledge about the city's architecture, culture, art and history and he brought us to many charming attractions we wouldn't have found on our own. Toby was amazing guy. Besides being highly personable, he was a member of the Edinburgh historical society and knew everything about all of Edinburgh's historical buildings (which were many). Highly recommend him. Not our favorite stop, however, we were not that impressed with our tour guide. Toby didn't know where he was going and we made several U-turns before we finally reached a destination. Too much time in the car and not enough site seeing because he wasn't that personable. TOUR GUIDE RESPONSE: I am very sorry to now hear that you did not appreciate the day. I included an additional castle because you showed interest and I did become a bit disorientated due to weekend roadworks. I was surprised that during a scenic drive you did not want longer stops and also refused the entrance to an intact historic interior and garden we previously discussed. Thank you for the feedback. Glasgow tour with Toby was incredible. Our family very much enjoyed. Toby is incredibly knowledgeable and his descriptions are passionate and beautifully delivered. So interesting. Thanks again to Tours By Locals and Toby. Toby is a terrific guide. He is extremely knowledgeable and funny, kind and courteous. He showed us around Edinburgh and the surrounding area on the day after an overnight flight, making the first day of our trip to Scotland very special. Highly recommended. Toby is a delight. If you are interested in architecture, art, and history of Scotland, he's your guide. It's like having a tour with your favorite college professor with deep insight into lots of the sights you will see. If you're looking for an actor to entertain you with questionable ghost stories, seek elsewhere. We had a wonderful time on two different full day tours with Toby. You will not regret your decision to book with him. We absolutely loved our tour with Toby. He was incredibly knowledgeable on subjects across the board. We learned so much and had a lovely day with him. So much great information on architecture and the history of Scotland.Toby was also very engaging with the children as well! Would not hesitate to book a tour with Toby again. Toby was fantastic. Extremely knowledgeable about all things Scottish including history, culture, geography and current events. He was very accommodating. We had a large group that wanted a customized tour which made things more complicated but Toby provided us with a lovely day. We had Toby for two days found him to be a consummate professional and Scottish gentlemen of the highest order. His advance academic accomplishments, insightful perspectives and devout nationalism brought the Scottish culture to life for us. Toby is an exceptionally knowledgeable and conversant tour guide. The scope and breath of his historical knowledge and perspectives on all things Scottish - culture, history and architecture - made our trip one of the best we have ever had. He was prompt, exceedingly polite and carefully answered all of our questions with a graceful and respectful manner. We had a wonderful experience with Toby during our full day walking tour of the Old aND New Cities. He was the ideal person to introduce us to Edinburgh, since we are interested in art, architecture, and history, and he is deeply knowledgeable in these areas and passionate about sharing what he knows. If we had wandered on our own for months we would have missed seeing several of the fascinating places he took us. And, he was a delightful companion. Thanks! We had a wonderful day. Toby is extremely knowledgeable and informative. Thank you for such a special day and showing us places we would not have thought of going to see. Thanks, Toby...we really enjoyed the tour !! This was just exactly the tour I wanted--got around the city a lot, saw lots of architecture and sites/sights, went outside the old city, went to a museum I wouldn't have gone to otherwise, had a wonderful lunch. It was interesting and enlightening! And Toby was so helpful with getting around in the city and restaurants close by where I was staying. Thank you so much, Toby! Toby was a joy to spend the day with traveling outside of Edinburgh. We were very interested in the history of the area and he planned a perfect day seeing castles and abbeys that gave us wonderful insight into the history of Scotland and how it fits within the current times. Very knowledgeable and with a great sense of humor. Perfect day. We were lucky enough to have selected Toby as our tour guide for two separate days. He moved us easily in and out of every historical site we visited which allowed us to see more places than we could have seen on our own. He made suggestions about good places to eat and things to do when we were on our own. It was a delightful tour and we absolutely would recommend Toby as a tour guide to anyone. Thank you so much Toby. We thoroughly enjoyed our tour with Toby. We had to make several adjustments to our schedule and he was so gracious and accommodating. We could not have asked for someone more knowledgeable about history and architecture, which made our tour even more enjoyable. Toby has a great whit about him which made the tour delightful. We would recommend him highly and would take another tour with him if we get the chance to return to Scotland. Toby is very knowledgeable in the history and architecture of the area and that benefitted us in understanding the region. He was very flexible (our ship's schedule changed the arrival time), and adjusted the tour to maximize the reduced time available. We thoroughly enjoyed our time with Toby and highly recommend his services. Toby was a wonderful guide. Extremely knowledgeable and passionate and energetic. Thank you so very much!!! We thank Toby for his excellent service and a depth of knowledge. At Traquair House a videoshoot of men and horses in Medieval outfits was an impromptu, unscheduled, and fantastic start to the day. Next lunch in Galashiels. Wandering Melrose Abbey Toby continued to demonstrate his knowledge of these ancient sites. Toby drove back 5 miles himself when I realized I'd left my camera in a gift shop, and left other forgotten items at our lobby desk! Truly an honorable man possessing a thorough knowledge!